Home / 2-Headed Monster / 2-Headed Monster: Should Auto Club Speedway Be Placed On The Chopping Block? 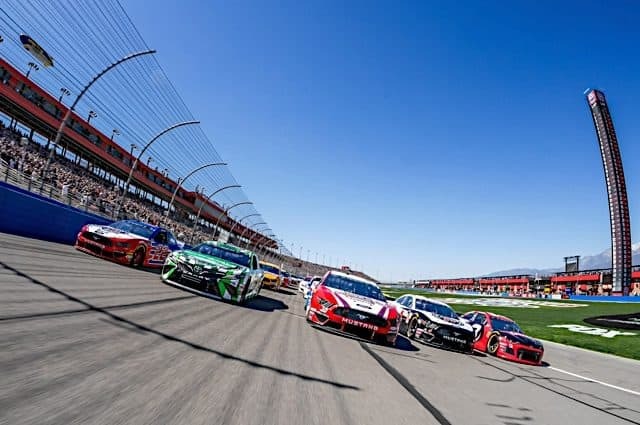 Despite playing host to Kyle Busch‘s 200th NASCAR national touring series win on Sunday (March 17), Auto Club Speedway underwhelmed on many accounts. The Auto Club 400 was attended by roughly 35,000 people — filling just over half of the 68,000 seats. Then there was the reaction on Jeff Gluck’s “Was It A Good Race?” poll which gave it a 37 percent approval rating. 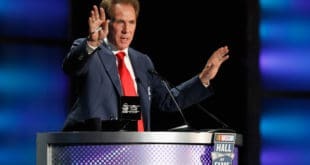 This race and reaction comes just after NASCAR President Steve Phelps said everything is on the table when it comes to schedule changes beyond 2020. That leads to this week’s 2-Headed Monster question: Should Auto Club Speedway lose its lone NASCAR date? Frontstretch’s Michael Massie and Wesley Coburn debate. Just because there are a lot of people in the vicinity doesn’t necessarily mean it’s a good idea to put a race there. IndyCar raced at Auto Club Speedway from 1997-2005 before giving up for a while and trying again from 2012-15. 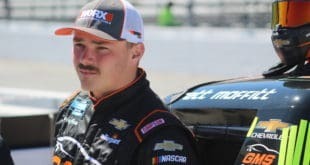 The Gander Outdoors Truck Series raced there from the track’s opening until 2009, while the K&N Pro Series West called it quits after 2006. Hollywood celebrities visiting looks good on TV, but unless they’re involved in a racing-related project, like Pixar working on the Cars trilogy or Will Ferrell’s Talladega Nights, there is little value in the splashy guests if they don’t care about the sport? Southern California is more geared towards drag racing when it comes to cars. And let’s face it, racing of any kind is far behind college and pro football, basketball, baseball, hockey or even soccer in terms of the area’s interests. NASCAR can’t compete against USC, UCLA or the X Games — not to mention the Angels, Chargers, Clippers, Dodgers, Ducks, Galaxy, Kings, LAFC, Lakers or Padres. The sports scene is way too crowded already. Scrap Auto Club Speedway since not that many fans attend and the racing isn’t all that great. Its spot in the West Coast Swing can be filled in by Sonoma Raceway’s date, which would (theoretically) provide an open weekend during the summer. The Auto Club 400 this past Sunday sucked, but we shouldn’t give up on Auto Club Speedway just yet. The track is NASCAR’s only link to the Los Angeles market, one of the two biggest in the country. By removing the Fontana track from the schedule, NASCAR would be abandoning SoCal. It would be a premature move that would deem the sport’s LA expansion as a failure. Remember how much of a bright spot it was for the sport when NASCAR first went there in 1997? Jeff Gordon’s victory at the new track was a popular one, California’s car culture latched onto the venue and NASCAR racing in the area was an instant success. 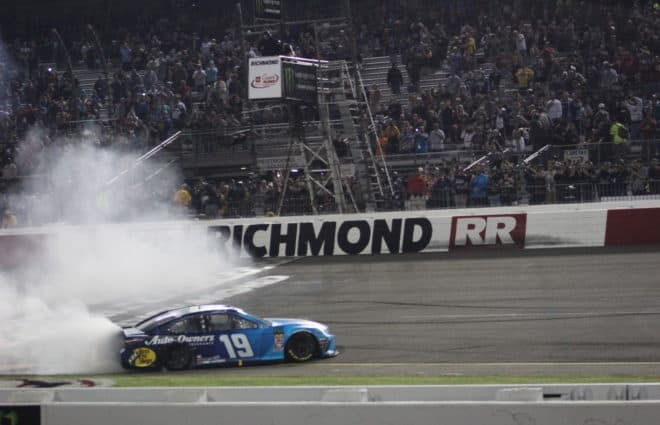 The track wouldn’t have gotten a second race date in 2004 if it hadn’t been performing well — 120,000 people attended the 2003 race won by Kurt Busch. The track provided great racing too. Jeremy Mayfield beat out Bobby Labonte by three-tenths of a second in the 2000 race, and Rusty Wallace topped Gordon by two-tenths the following year. Elliott Sadler edged Kasey Kahne by two-tenths to win the Fall 2004 race while an even faster Mark Martin settled for third. The closest margin of victory at the track came in 2011 when Kevin Harvick beat Jimmie Johnson by one-tenth. 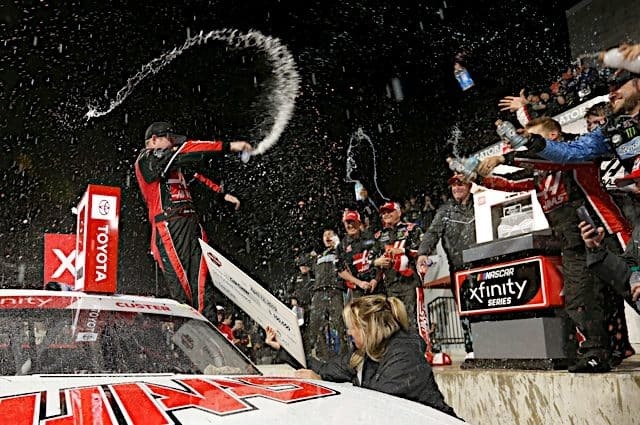 Speaking of Johnson, Fontana is where the legend of “Old Seven-Time” began with Johnson picking up his first career Monster Energy NASCAR Cup Series win in the 2002 race. 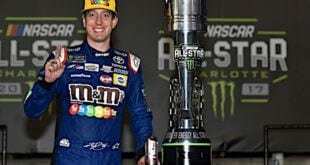 Kyle Busch also won his first race at the track. The point is that Auto Club Speedway built up a formidable reputation in its first decade or so of existence. That reputation did not decline because the track is bad for racing. In fact, the track’s surface has aged so well that it is a rough, bumpy course that is difficult on drivers and tires. The extreme tire wear can produce interesting races given the right circumstances. So the track is not the problem — the cars are. There used to be good racing at intermediate tracks, but then NASCAR introduced the Car of Tomorrow, followed by the Gen 6 car. Both cars were and are so aerodynamically dependent that it makes racing side by side nearly impossible. Then, NASCAR decides to use this current high downforce package with tapered spacers on the car. The result is we have a bunch of really slow cars that can’t pass each other. Why would California residents buy a ticket to see that when they could see the same thing on their highways for free (barring any tolls)? Getting rid of the track wouldn’t solve the problem — we’d end up with the same problem in a much smaller market. 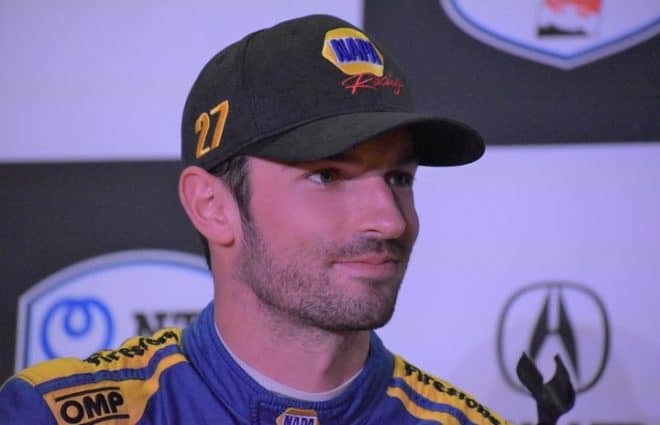 But if NASCAR finally fixes the racing issues with its Gen 7 car, which is supposed to launch in 2021, then maybe we can finally have a can’t-miss show at the track that is entertaining enough to draw in the LA crowd. Every year, NASCAR promises us exciting racing but never delivers. 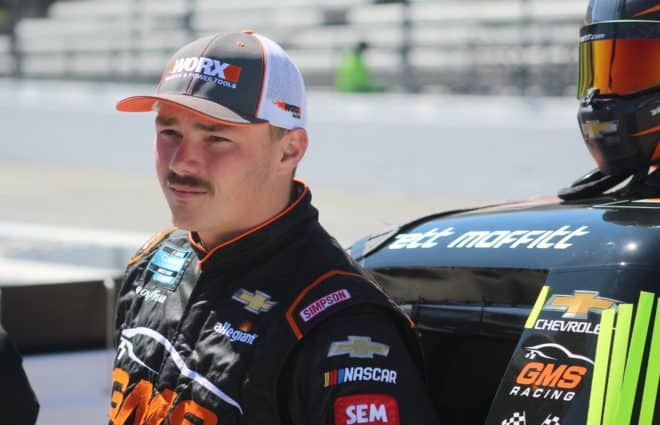 They need to admit that the problem is that they’re not racing stock cars anymore. Fans want to see real Ford’s, Chevys, Toyotas, Dodges on the track, not just spec cars with different paint schemes. I’m willing to bet that there’s not one stock part on the entire car. Trouble is, if they were to go back to real stock based cars,then they would lose all of the kids kickback $$ that they’re getting from the specialty equipment manufacturers. When they finally lose their tv package maybe they’ll wake up. But then it will be too late. Cars haven’t been stock in 30+ years. It’s gotten so expensive for everything. A family doesn’t like dropping that much money. Especially for the mediocre racing of late. I’ve been a volunteer at Fontana for 17 yrs now and have seen a lot of changes. We used to work Cup, Xfinity and trucks in the weekend, we had Indy Cars, and Super Bikes. Now we have one weekend with 2 divisions. The marketing hasn’t been very good either. Past track President seemed content to not do anything to bring the tracks image up and let people walk away upset. I feel it can still be a successful venue if managed correctly. If the second largest market in the US can only attract 38000 is it really the second largest market in the US as it pertains to NASCAR? I’d be so heartbroken if NASCAR left Auto Club. And for purely selfish reasons. It’s the closest track that I can easily visit. I live approx an hour away. My first experience with NASCAR was there in 1999 and this past time was my 20th straight year. Yeah the racing was bland last weekend, but that’s the aero packages fault. Idk, maybe it’s time for a repave? Maybe a reconfiguration? Like more or less banking. But hopefully we can keep it on the schedule. Sorry to make this sound like so much of a plea lol! Any talk of abandoning the Fontana speedway should be done in the context of the Ontario Motor Speedway which once existed just down the road just two miles to the west. That ambitious project failed and has been re-purposed. I’ve been there a few times and it seems to be far removed from any car-oriented action in LA. What was Roger Penske thinking when the built this track? Fontana is a copy/paste of Michigan and Ontario was a copy/paste of Indianapolis. The lesson being if they’d gone to somewhere like Irwindale, nascar could be successful in California. If they took all the 2nd dates away from all the tracks greater than 1.5 miles and replaced them with short tracks or road courses, then we might actually look forward to Cali once a year. Bottom line, I am fine with visiting the track (or any track) once a year. The attendance is another story. I don’t really keep tabs on track attendance but I doubt Cali is the lowest attended race during the season. 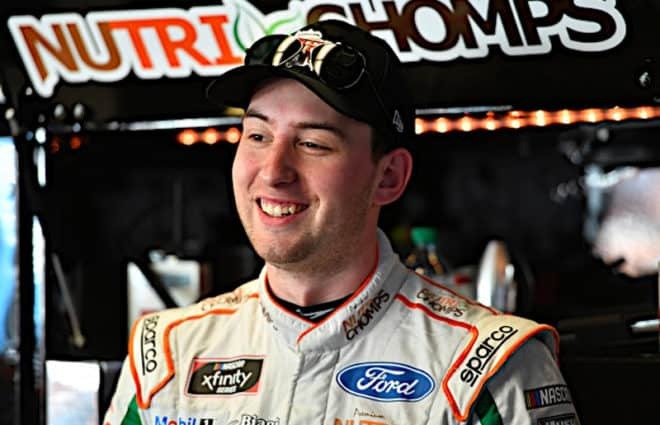 What would be an interesting change would be a west coast roval at Fontana. Auto Club Speedway would be the place. Just a thought. This question can be answered by answering another question. Who owns the track? Think they are going to give up the revenue, however small to someone else? I dont either.